Love how this bag folds up into almost nothing. Very unique and stylish. Thanks for being so patient when assisting me too Custom Earth Promos. I use CEP to promote often. This bag was special. When you fold the bag up you can still see the logo that Custom Earth Promos customized for me. If I could give this bag 10/10 stars I most certainly would. The folding attribute is very unique and I love it. My husband and I thought this would be a great bag to buy in bulk to giveaway at our upcoming convention and we were so right. Placed a bulk order on these bags the other week and they came in! SO happy with the final product &how the logo looks to advertise my company. Thanks CEP. I have a trusted relationship with CEP and use them for a variety of promotional products. This bag was great! Custom Earth Promos really has great customer service and delivers great products! Never had a bad experience with them. Five star rating from my staff and I!!! Great product the colors print beautifully. Just placed my order, I am very excited to receive the finished product. Based on the reviews and the samples we have received, I am confident the bag will be nothing but spectacular. Good marketing tool, custom earth promos is a great resource for me. good wholesaler of reusable bags. I liked how when you fold the bag your company logo is still visible. I ordered this folding tote for this reason. Just received our order and it looks great, all received and the way we specified. I ordered umbrellas and this bag to use as prizes for our trade show, we did some interactive challenges this year and it turned out great. We generated a lot of interest in our brand. We bought the lime and purple colors, It looks good we went with a simple white print for each. Wonderful product, all the recipients of the gift loved it. This is a great product. 5 stars in my book. Folds away great, I hand them out folded up at our events. It makes it easier because they are compact and the logo is still visible. I never had a problem with this bag and I order it all the time in bulk. Custom Earth Promos presents the accommodating, eco-friendly Reusable Folding Shopping Bag as an exceptional alternative to plastic bags. Promote your business or cause with a fashionable, multi-function design that inspires your customers to join you in the fight for ecological sustainability. With comfortable shoulder straps and an impressive size of 15" W x 18.75" H x 7.5" D, your customers will be using these eco-friendly bags over and over again. These shopping bags are designed for optimal brand exposure, showcasing an open imprint area of 10" W x 10" H on the non-pocketed side and showcasing custom graphics on an imprint area of 4" W x 1.5" H on the snap-closure pocket when folded. With so many options for customization, our Reusable Folding Shopping Bags meet the promotional needs of clients in a wide variety of industries. From hospitality and healthcare to beauty, retail, food and beverage, all businesses can appeal to their target audience and increase brand exposure with this commonly used product. Work directly with the Custom Earth Promos' design team to create reusable bags that display custom graphics of your company name and logo. Build brand awareness recognition by including a catchy tagline or witty slogan to your eco-friendly shopping bag. Effectively market your business everywhere customers carry their folding totes, simultaneously showcasing a commitment to planetary conservation that will be admired and appreciated by prospects and future customers. 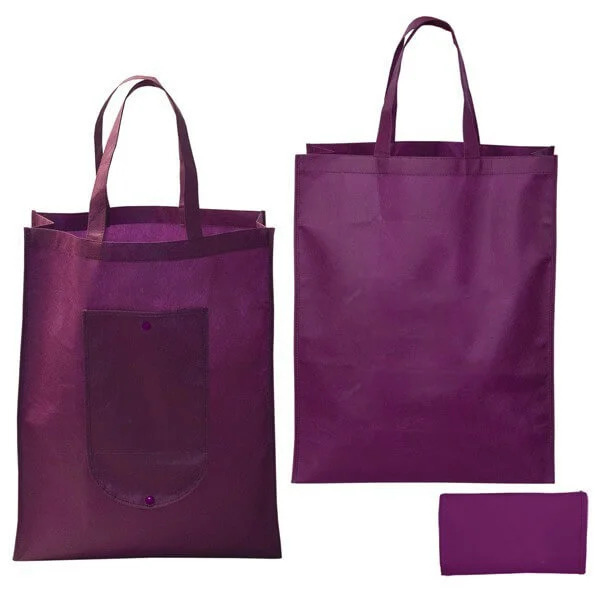 These Reusable Folding Shopping Bags are available in five attractive colors; black, royal blue, lime green, red and purple. Choose your favorite color to complement the company logo and/or slogan or opt to include a combination of colors in your order. Foldable totes from Custom Earth Promos give you a stylish brand marketing solution while strengthening recognition of eco-responsibility for your brand. With 90-gram polypropylene and an impressive size of 15" width, 18.75" height and 7.5" depth, these reusable shopping bags are durably designed for long-term, multipurpose use. The foldable feature with snap closure provides additional convenience to these eco-friendly alternatives to plastic bags. Your customers will appreciate the convenience and comfort of your custom shopping bags, increasing brand exposure and awareness everywhere they go. Work directly with our design experts to style your Reusable Folding Shopping Bags with eye-catching graphic imprints that are unique to your brand. Stand out from your competitors with an attractive and eco-responsible promotional product. Choose from a wide range of printing options that include screen printing, transfer printing, and perfect printing. With imprint areas on both the front pocket and back, our folding bags guarantee optimal brand exposure. Fully customize your Reusable Folding Shopping Bags by choosing to directly order overseas with Custom Earth Promos. Convey the true values of your brand by imprinting a variety of graphics, custom messages or slogans with edge-to-edge printing and color combinations. Personalize each folding bag to display the customer or recipient's name and increase the material density for added product durability. With our factory, the freedom is yours to adjust product dimensions, customize the fabric colors to complement your company logo or add pockets and insulation. Whatever your preferences are, we can make it happen!